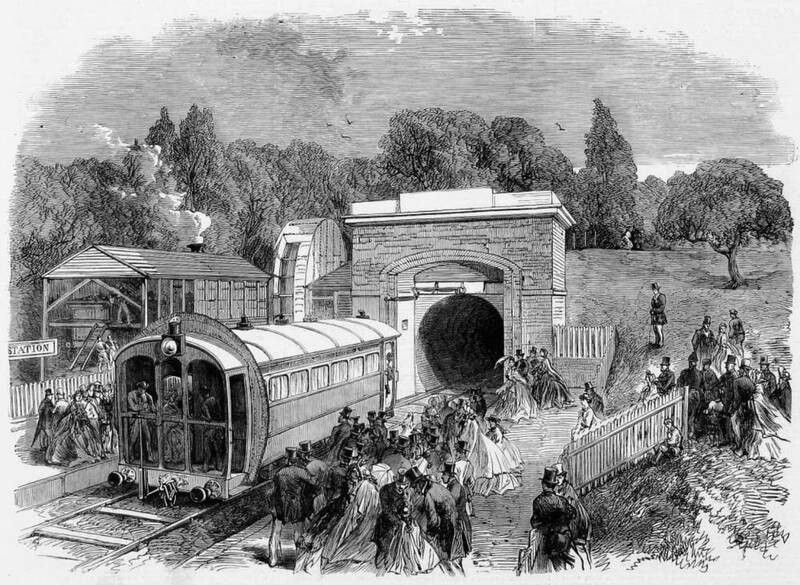 runel was converted to the ill-fated atmospheric or pneumatic railways, first mooted in 1810, after witnessing a demonstration in Ireland in September 1844. The system, which had been patented in 1838, entailed the use of a cast-iron tube laid between rails, to which carriages were attached by a valve. Pumping stations powered by steam engines at the side of the track forced air out of the tubes, thereby creating a vacuum to one side of the carriages and an "atmosphere" to the other, thus propelling them along. But the whole project was dogged by practical problems, not the least being the difficulty of securing a moveable airtight seal between tube and carriage. Brunel's colleague Daniel Gooch said of it: "I could not understand how Mr Brunel could be so misled. He had so much faith in his being able to improve it that he shut his eyes to the consequences of failure;" George Stephenson called it "a great humbug," and his son Robert compared it to rope-haulage. The South Devon Railway Company Act received the Royal Assent on 4 July 1844. Brunel was consulted by the directors, and he successfully urged them to adopt the atmospheric system. The atmospheric system never really worked and cost the company an enormous amount of money, much of the equipment being sold as scrap. The South Devon eventually opened as a locomotive-hauled railway in 1849. It became known to Devonians as the "Atmospheric Caper." A side-note to the Macaulay-Brunel connection: In 1843 Macaulay was observed running along the pavement towards the Athenaeum Club shouting "It's out! it's out!" — everyone knew to what he referred: Brunel had been delivered of the gold coin that had lodged in his throat for fourteen days, a tracheotomy proving less successful than being strapped to a table, turned upside down and struck on the back. Pneumatic railway for passengers at the Crystal Palace. (10 September 1864): 276.